The Bellvue Grange can now face the sunrise with both “eyes” wide open. For as long as many people can remember, the windows on the grange have been boarded up. Vandalism was such a problem in the 1960s and 70s that the residents, in exasperation, just covered the openings over with siding. But recent renovations have led to the replacement of both windows in their original openings. The Grange was built in 1882 by Jacob Flowers as a mercantile store. With all of the quarrying taking place in the area, and lumber coming down from the mountains, it was in a perfect location to provide goods, as well as mail delivery, for those who passed through. For a time the building also housed a blacksmith shop, a barber shop, and a saloon (though perhaps not all at the same time). 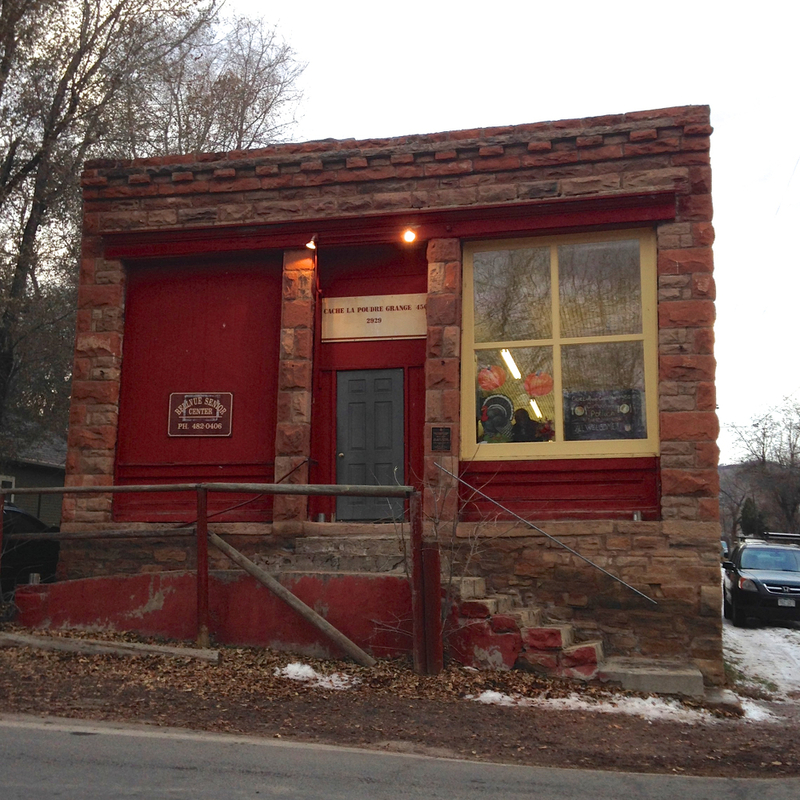 It wasn’t until 1948 that the building became the Cache la Poudre Grange, Chapter 456. The National Grange of the Order of Patrons of Husbandry was first founded in 1867 in Fredonia, NY. It became a national movement, providing a focal point for agricultural communities as well as advocating for the concerns of farmers at the national level. Women were included from the very beginning and a percentage of elected positions were required to always be filled by women. Teens were also invited as they were seen a future farmers. 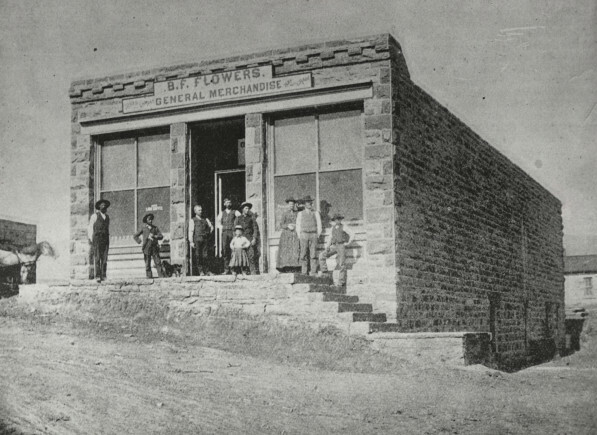 B. F. Flowers – General Merchandise (From the Fort Collins Archive – H08801.) This photo is from some time before 1915, as that’s when the building ceased operations as a mercantile store. With family farms being consolidated into increasingly larger operations, Grange membership nationwide has fallen 40% between 1992 and 2007. Many Grange buildings are either torn down or used for other purposes. It’s rare that a historic Grange building is still used in the present day by a local chapter. But that’s exactly the case in Bellvue, Colorado. One of the original purposes of the Grange movement was to provide a community center for small rural communities where they could hold meetings regarding agricultural issues, as well as potlucks, dances, and other events. Today the Bellvue Grange continues to be used by the Bellvue Senior Center and other community groups, as well as by the Cache la Poudre Grange chapter. This photo, taken in November 2014, shows the Grange with only one window installed. Ironically, much of the recent work on the building came about as a result of the community’s response to a proposed RV park near the Horsetooth Dam a little over a decade ago. As the neighbors gathered to discuss the proposed project, they started to get to know each other better. Talking about their community led to talking about many of their historic properties, including the Grange. 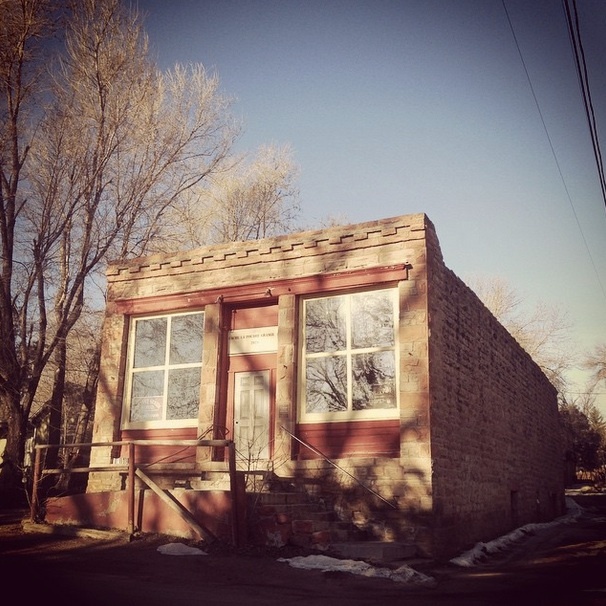 In 2005, they sought a state level historic landmark designation for the building. And with the renewed interest in the history of the building came a desire to restore the structure to its original glory, including re-installing the front windows. One window was changed out a couple of years ago. But the second window was just put in a few weeks ago by volunteers: Craig Brodahl, Robert Baxley and David Smeltzer. So the next time you’re traveling west on Rist Canyon Road, or north on County Road 23 (Front Street), be sure to take a moment to stop and enjoy the freshly rejuvenated Bellvue Grange building. James, Libby. “Bellvue Grange Has New Window.” North Forty News 1 Mar. 2015: 3. Print. Sokoloski, Cherry. “Bellvue Boosters Preserve History.” North Forty News 1 Dec. 2009. Print. Information on the origins of the The National Grange of the Order of Patrons of Husbandry came from Wikipedia. 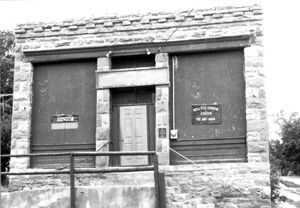 The date of construction for the Grange, the reason for the windows being covered over, and the fact that a blacksmith shop, saloon, and barber shop were all housed there at one time came from the Colorado State Register of Historic Properties Nomination Form, which was prepared by Ron Sladek, President of Tatanka Historical Associates, Inc. in 2005. Thanks! I got that info from Google. I know where to turn, but I never pay attention to the name of the street when I’m there. I’ll change that in the post. Thanks again!